Product prices and availability are accurate as of 2019-04-16 22:13:49 EDT and are subject to change. Any price and availability information displayed on http://www.amazon.com/ at the time of purchase will apply to the purchase of this product. 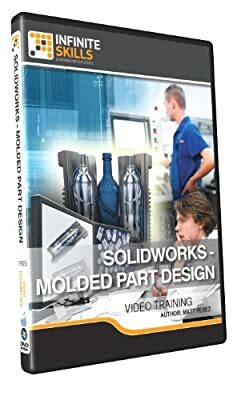 In this SolidWorks Molded Part Design training course, expert author Matt Perez will show you how to use the drawing tools in SolidWorks to create 2D engineering production drawings of parts and assemblies. This course is designed for users that already have a fundamental understanding of SolidWorks. You will start by learning how to set up your command manager and toolbars. You will then move into learning how to create a simple molded part. Matt will teach you about the various molded features, including lip and groove, snap latch, and molded inserts. This video tutorial will also teach you complex molded shapes, parting line designs, and manual draft fixes. Finally, you will learn how create a multi-body complex part. Once you have completed this video based training course, you will have an in-depth understand of how to use the drawing tools to create your own 2D projects, and be able to apply this knowledge to prepare for the SolidWorks Drawing Tools certification exam. Working files are included, allowing you to follow along with the author throughout the lessons.